If you've begun planning an upgrade to Ryzen later this year, one thing you might be able to check off the list is a new CPU cooler. Several cooling companies have promised to provide free upgrade kits to support the crop of AM4 motherboards on the horizon, Phanteks being the latest to join the fray. "Starting January 25th, 2017, customers that have our CPU coolers can contact our service team to receive their free upgrade kit," Phanteks said. "To receive the AM4 upgrade kit, customers will need to provide a copy of the purchase invoice [of the CPU cooler], copy of the purchase invoice of an AMD motherboard or AMD processor, and email to our customer support team. 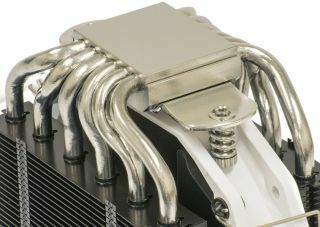 All future Phanteks cooler products will include the required AMD AM4 mounting bracket. Canada and USA Customers, please email support@phanteksusa.com. International Customers, please email support@phanteks.com." AM4 is a new unified socket and platform for AMD's upcoming Ryzen family of processors, including next generation APUs. AMD hasn't said much about cooler compatibility, though compared to AM3+, it appears that AM4 boards will use a slightly different mounting placement. That would render a large number of CPU coolers incompatible with Ryzen. That is where the free upgrade kits come into play and Phanteks is one of at least 10 cooler makers that have pledged to provide bracket for AM4 at no cost to existing customers. The other ones, according to an ongoing list on Reddit, include Alphacool, BeQuiet, Corsair, Cryorig, DeepCool, Enermax, Noctua, SilentiumPC, and Thermalright.